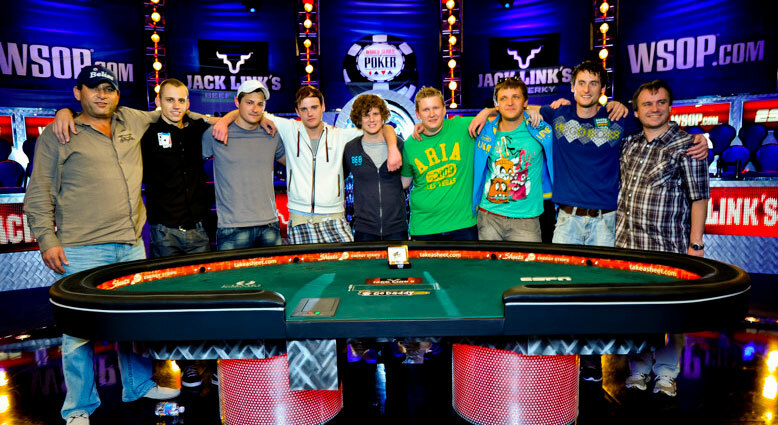 2011 World Series of Poker has reached the climax point… the November Nine! Although the WSOP will continue on in to Europe, the big one, set for November is the prize everyone is looking at. 6,865 players came to Las Vegas searching for fame, fortune and glory of being crowned the latest World Champion of Poker. With a total prize pool of $64,531,000 USD and a whopping $8,711,956 going to the eventual winner, this is set to be another great year for poker. The trend for the last few years have been that the November Nine seem to be getting younger each year. This year again could crown the youngest ever champion once again in the Ukrainian Anton Makievskyi. ESPN has aired live coverage with 30 minute delays and only showing hole cards once players reach the flop and revealed to audiences once the hand is complete added a whole new dynamic never seen before in any major tournament. Although some were against the idea, most of the greater poker world accepted the idea as the future of live poker. From an All Aussie Poker perspective, it sure as hell made hours of fantastic viewing. – Matt Giannetti of Las Vegas is a 26-year-old poker pro. Gianetti attended the University of Texas. He has cashes to his name totaling nearly$500,000 USD, including 10 World Series of Poker cashes. His best previous finish in the Main Event was 521st in 2006 for $22,266. Matt went into the 10-handed final table as one of the short stacks, but has battled his way into third in chips. – Badih Bounahra is a 49-year-old businessman and father of three originally from Lebanon now residing in Belize City where he runs his own card room. He has a few cashes to his credit, including one WSOP cash from 2008 in a $2,000 NLHE event. He is the oldest person left in the Main Event, 14 years older than the next oldest in Martin Staszko. – Eoghan O’Dea of Ireland is a 26-year-old student. His poker resume includes a number of cashes dating back to 2005, including three already at this summer’s WSOP. He’s the son of the famous poker player Donnacha O’Dea, member of the European Poker Players Hall of Fame. His father has also made a 3 final table appearances in the WSOP Main Event with his best finish of 6th. Seat 4: Phil Collins (23,875,000) – Phil Collins is a 26-year-old poker pro originally from Rockford, Illinois who now calls Las Vegas home. Although some may think the famous musical artist is at the final table, he in fact was named after the man. His rail would often sing “In the Air Tonight” each time he won a pot. – Anton Makiievskyi of Dnipropetrousk, Ukraine is playing in his first-ever WSOP. He’s looking to be the fifth Ukrainian to take home a WSOP bracelet this year, which would pull Ukraine into a tie with Canada for the second-most bracelets of any country behind the U.S. If he wins, he will be the youngest ever WSOP Main Event Champion. He wears his friends Ukrainian jacket who won a WSOP bracelet earlier in this series for good luck. Seat 6: Sam Holden (12,375,000) – Sam Holden is a 22-year-old poker pro from Canterbury, England. The former student is making his WSOP debut this year, and this marks his first WSOP cash. He has a few scores from the UK & Ireland poker tour, including a first-place finish last month in a NLHE six-handed event, though no previous cashes above four figures. – Pius Heinz of Cologne, Germany is a 22-year-old student who first learned poker via home games with friends. This marks his first WSOP, and it has been a successful one, including a final table in Event No. 48 ($1,500 NLHE) where he finished seventh to earn $83,286. – Ben Lamb is probably the most high-profile at the table. He has more than $2.5 million in career winnings and numerous WSOP cashes. Lamb also earned his first WSOP bracelet this summer in Event No. 42, the $10,000 PLO Championship, and added 2nd place and another deep run to put himself in first place in this year’s WSOP Player of the Year race, overtaking Phil Hellmuth in the Main Event. Lamb’s previous best finish in the WSOP Main Event was a 14th-place finish in 2009. Seat 9: Martin Staszko (40,175,000) – Martin Staszko is a 35-year-old poker pro from Trinec of the Czech Republic who previously worked in the automotive industry. Stasko has four cashes at the WSOP already this summer, his best finish being 39th in the $1,500 PLO8 Event No. 51. He is the 2nd oldest at the table. We will now wait 4 months until the Final Table will then resume and a new Champion Crowned.